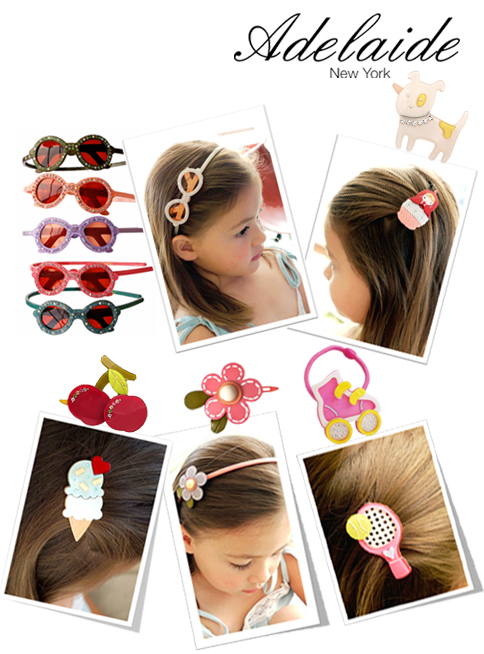 Adelaide New York offers a gorgeous collection of unique and high quality hair accessories for girls and moms. We all know the right accessories can make or break an outfit, and it is obvious Adelaide agrees with the theory. The headbands, hair clips, and ponytail holders are absolutely darling and provide a special finishing touch to any outfit, casual or dressy. One of our favourites is the Crystal Sunglasses Headband. Available in a variety of colors, the headband is part kitsch, part glam, and total perfection. The headband is a traditional hard plastic headband with a Swarovski crystal-covered faux glasses. The thin headband stays put on the girls’ head and while they love the crystals. These headbands are seriously cute! The Adelaide hair clips have personality and flair to spare. Many are bejeweled with crystals and the collection includes everything from carrots to crowns to adorable animals. The clips are more expensive than average but we think they’re worth a splurge to add the perfect finishing touch to any outfit or for a special occasion.